On the crisp Friday I visited Josh Johnson's orchard in Sherwood, I didn't realize it was his day off. 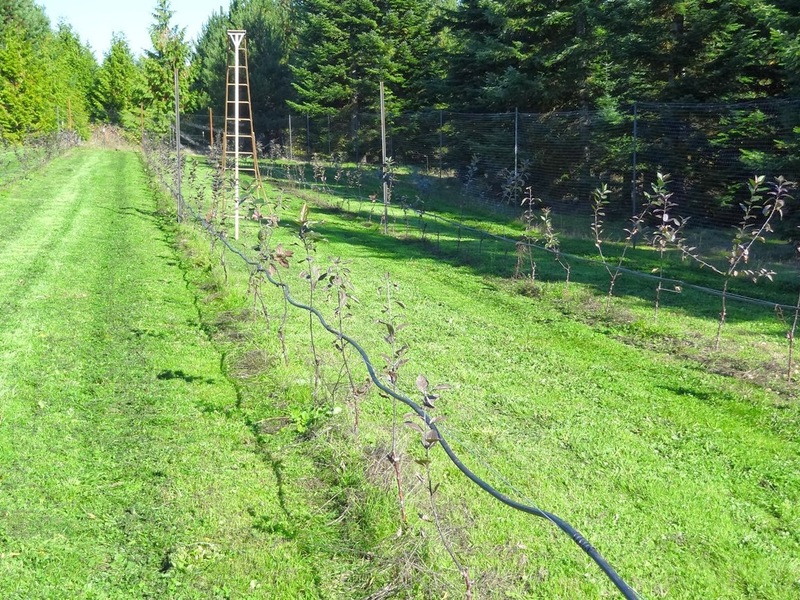 Finnegan is a cider currently made from apples from the Skurdahl orchard just down the road, but in a glade protected by deer fencing, Johnson has planted 2,000 of his own trees. On the other four days of the week, he holds down his day job as a neurologist. He has Fridays off (sort of--during my visit he was still taking calls), and those are his orcharding days. 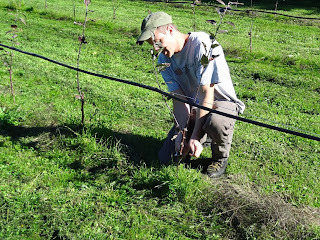 As we talked cider, he was freeing his wee saplings from graft tape. One tree at a time, down a long row. I scanned orchard-to-be: lots and lots of rows. I expect he returns home tired each night. The idea is that the whole orchard will go to a single blend for his cider. 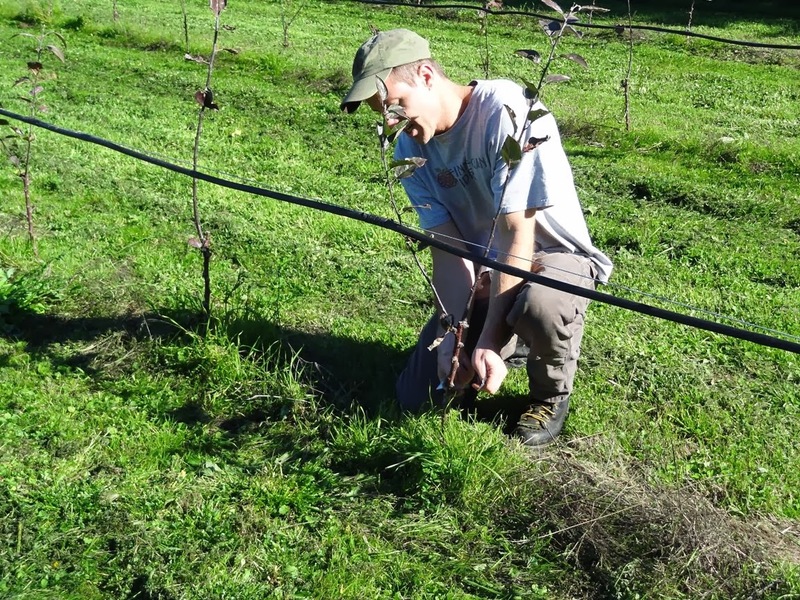 The Skurdahl's have one of the few orchards with cider apples in Oregon, and Josh likes the depth of flavor that comes from a blend of apples. “If you make it from one variety or two, it’s just not going to be as interesting as if you make it from a bunch of different varieties.” He's planted a broad range of familiar varieties: Kingston Black, Dabinett, Roxbury Russet, Foxwhelp, Michelin, Golden Russet, Yarlington Mill, Ashmead’s Kernel. The idea that each year, as the seasons and conditions conspire to produce different apples and different configurations of the blend (Michelin yield weak one years, strong the next), his cider will have the annual variability of wine. As we talked, wine kept coming up. Josh actually began making wine first, adding cider later--now about twelve years ago--and it seems to remain his main template. He likes the way tannins and acidity blend with apple sweetness--like wine. He likes how cider complements food--like wine (though he ventures "I think it's better than wine"). And he even hopes cider will follow the trajectory of wine, where people went from drinking uninteresting, mass-market stuff to appreciating sophisticated wines with depth and complexity. Finnegan comes in three types, but they differ only by sweetness. Dry is fermented out to a final gravity just a notch below water (0.999), Semi-Dry to 1.005, and Semi-Sweet to 1.010. “I just made cider that I liked to drink ... cider that has some residual sweetness, good carbonation, and is relatively clear and no artificial carbonation.” That's what you find in a bottle of Finnegan. I love dry ciders, so my fave of the bunch is the Dry, which has a wonderful structure and lots of tannins. Amazingly, Josh would love to make the cidery (named after his wife, Colleen Finnegan) his full-time job. I was so startled by this fact I asked him what it was about cider that engaged him so much. I'm not sure I ever got a good answer; leaving neurology to pursue cider-making is ... uncommon. But he did tell me a story about one of his first encounters with apples. “It was in California, in this place in the Sierras and they were pressing apples. I remember having this strong sensory experience—just the smell of those apples being pressed, and the fall, and being in the mountains.” When he started making cider again, he kept “coming back to that, the smell and flavor of apples.” Could that be enough? I'll have to ask the next time I visit. After an hour, I had to let him get back to his trees.